A fundamental problem with browsing code and doing software product engineering is that there is an insufficient method for handling the simultaneous layers of abstraction that occur. Consider a workflow, of any kind. As product people, we speak of “the workflow”, generally referring to the highest level of abstraction of that workflow; the “happy path”. There is of course a second, more complex, more complete, “full workflow”, that includes all of those little nitty rules about handling this case or that case. These are the “edge cases”. But our code - generally - doesn’t distinguish between the “happy path” and the “edge cases”, not when we browse. When we edit a file, we’re editing all of those rules at once. We can’t hide the edges, and manipulate just the big concepts, then fill the edges back in. This is, of course, what Object Oriented Programming, and every programming discipline, is designed to do in theory. Type systems, automatic compile time checking, all of it, is designed to help us in one way or another manage that complexity. Code generation tools and scaffolding helps us do this in some way - in that it allows us to generate a lot of code for the “happy path”. But once it is generated, then we’re stuck operating at that lower level of abstraction again. Why can’t we go back up a level of abstraction and push the shapes around once we’ve filled them in? Why are we stuck shoveling edges around one by one? I have dedicated a portion of my portfolio to ‘picocap’ (under $50 million of market capitalization), over-the-counter-traded companies. This post is part of a series of reflections on beginning to invest in these companies. Most traders and investors will be familiar with the idea of “NBBO”, or “national best bid and offer”, a Securities and Exchange Commission-created term that refers to the best bid for a particular stock across all exchanges, and the corresponding best offer. That is, if the highest-price buy limit order placed is for $10.00 per share for 100 shares, and the lowest-price sell limit order placed is 100 shares for $10.02 per share, the NBBO is $10.00 x 1 - $10.02 x 1 (1 being short for 100 shares, or 1 lot). However, in the wild west OTC markets, where the spread can easily be 10 or 20% of the share price, there’s a particular rule you should be familiar with - miniumum quotation sizes. FINRA rule 6433 establishes minimum quotation sizes for orders. That is, if you enter a limit order for $0.50 per share for a stock for 1,000 shares, your order will not be posted to the market, unless, potentially, your order is combined with another equal-priced limit order at the same routing dealer - which, in these exchanges, is only somewhat likely. I don’t have a clear idea of how that would work. Your limit order will still be accepted, though, so if the ask then crosses your limit, it’ll be executed - but presumably, you entered your limit buy because you didn’t just want to hit the ask. That is, if you want to avoid paying the spread - which, remember, for these OTC stocks, can easily be 10-20% of the share price - you need to have, generally, about $1000 to $1250 to enter the position. Second, certain normal behaviors, including partial fills, make trading much more expensive. Consider a small trader who wants to open a minimum-sized position in a stock trading around $0.40 per share. He or she enters an order for 2500 shares at $0.4010 for 2,500 shares, for $1002.5 order size. A few minutes later a market order for 2 lots comes through, giving a partial fill. This reduces the order size to 2,300 shares, putting it below the minimum size and taking it off the board. At least with Fidelity, you cannot increase the share count for a partially filled limit order, so you are only left with the option of cancelling the order and entering a new one, which means paying two commissions - effectively paying a $4.95 commission for a 200 share, $80 order. To deal with this, you may consider entering orders that are larger than the position you may want to open, and cancelling them if you end up with a partial fill. Ideally, this order would be at least twice the minimum, so in the event of a full fill, you can post a minimum-size ask and maybe make the spread. Finally, you may consider asking your broker about the exact minutiae of their order-edit rules and how commission is charged, to avoid over-paying for many partial fills on limit orders. This post will likely become out of date very shortly as Amplify Improves. If it has been more than 2 months since this post, please consider this “reader beware”. A few months ago, I noted how wonderful I found AWS Amplify. Since then, Amplify has only improved. With Amplify, you can get an almost Rails + Heroku like experience, e.g. using amplify add auth to add authentication to your application from front end through AWS Identity pool, amplify add hosting to set up S3 or S3 + CloudFront based hosting for the static assets of the site, and “amplify publish” to both deploy Amplify-generated CloudFront setups and simultaneously push static code to S3, much like heroku push. However, I had some trouble getting Amplify set up with React, ES6, and Webpack. I believe that at this time there are several library versions that are in flux, meaning that many existing tutorials are out of date. At the time of writing, this should give you a functional setup. First, set up a new project with NPM. Note that this does not include the aws-amplify-react package. Then make a basic folder structure - you can just ‘touch’ index.html and ‘package.json’. And inside your app folder, initialize your amplify project with amplify init. Note that we’re using Babel 6 here. At the time of writing, Babel 7 had been released. Babel 7 renames several of the babel packages - for example, babel-runtime becomes @babel/runtime see package. However, at least to the best of my knowledge, there is some dependency in the React and / or aws-amplify packages that prevents using webpack + babel 7 + react + amplify together. Note that the key aspects here are: adding ‘.js’ and ‘.jsx’ to your resolve: extensions section, and adding the ‘CopyWebpackPlugin’ to your ‘plugins’ section. Once this is done, you can add hosting with amplify add hosting, and then push any changes you’ve made to your app with amplify publish. Preface: I’ve become obsessed with Wardley Maps. Wardley maps are true maps - that is, planes with direction and movement - that help you understand the implications of a business’ strategy. If you’re not familiar with them, I recommend reading Simon Wardley’s WIP book on Medium or trying Ben Mosior’s Build your First Wardley Map. Wardley maps have become an important part of my decision making toolkit. I use them to understand & communicate the strategic considerations of companies I interact with. However, the strategic implications of Wardley maps can come into opposition with other decision making tools. Whenever we see contradictions from trusted rules, we must dive deeper - either one of our tools is broken, or we’re not seeing the whole situation. In this post, I’ll consider what we’re missing when the Wardley Map contradicts a capital budgeting rule, like the IRR rule. This post will assume you are familiar with Wardley Maps. It will also assume you understand the IRR rule. If you are unfamiliar with the IRR rule, see a brief explanation at the bottom of this post 1. Let’s consider a real-life situation. Here’s an example map for, say, Dropbox, prior to them moving their storage services from S3 to a custom-built solution. Let’s say we’re Dropbox, and we’re evaluating a proposal to invest significantly in building our own storage service, and move off of AWS. The IRR rule works out - at least on our projects, we can invest some reasonable amount, and save immensely on our AWS bills. But building a custom replacement for Amazon S3 is replacing something that is at least a ‘product’, if not a utility, with a custom-build option. That is moving our dependency to the left on the Wardley map - against the grain of history! By doing so, we’ll lose out, or have to pay to keep up with, any benefits that would accrue naturally over time, as components move rightwards on the map. Let’s assume that we’ve already negotiated as hard as we can against Amazon, and that we can’t get a suitable quote from any other provider (replacing S3 with another competing service would not imply changing our map, and so there would be no conflict, and negotiating well is just good business sense). We appear to be in a dilemma: either (a) our Wardley Map is steering us wrong, and custom built is the way, (b) our IRR rule is no good, and we should keep paying Amazon for S3. I propose that in this situation, our cost of capital is too low. We should find ways to increase our cost of capital, by adding risk, by developing new products, by buying back equity. 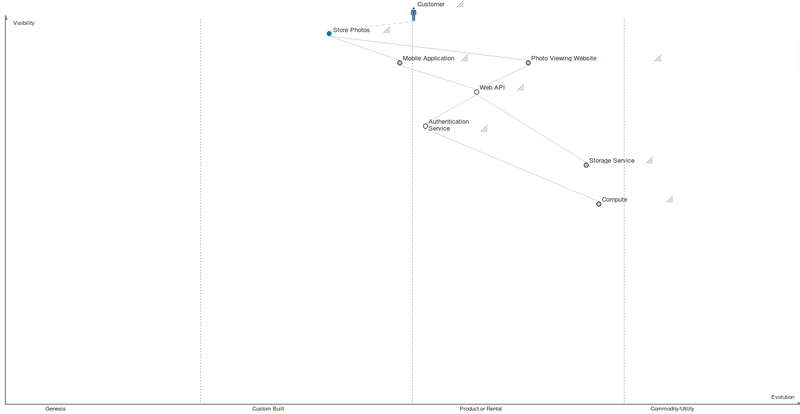 Consider how the cost of capital varies with the x-axis of the Wardley map. To the left, in the Genesis and Custom Built zones, we have high risk and high uncertainty. Our cost of capital is high. As we move rightwards, towards utilities, our cost of capital should decrease - building a new power plant can be done for practically zero cost of capital, with government bonds. Consider Dropbox’s map above. Like maps for most companies, the end user need that is being fulfilled is leftwards of many of the internal dependencies. That is, the cost of capital for the business as a whole should be higher than the cost of capital for some of the internal dependencies, considered in isolation. If our cost of capital happens to be such that it looks like we can make profitable but non-strategic investments low in our value chain, it must be because our cost of capital is that of a more mature company than we actually are - and we should increase our cost of capital (share buybacks! dividends!) to compensate; not tilt the windmill of building a custom utility. Some notes from setting up AWS Cognito for authentication on a new SPA, but turns into notes about AWS Amplify. Note that the aws-sdk library will default to use the [default] credentials configured in ~/.aws/credentials, and may fail silently to override them. Note that it appears that Identity Pools created from the SDK will not appear on the dashboard until you have added a user. Alternatively, this may just be an artifact of eventual consistency on the API. If you are interested in using AWS Cognito, I suggest you additionally look at AWS Amplify, which helps get you started with Cognito + several other AWS product in one neat package. You cannot change the above setting. As such, I suggest not creating a Cognito User Pool through the Amplify CLI; it makes local development far more painful than necessary. Instead, create the Cognito User Pool through the dashboard or using a script. If you are using Amplify, I’ve started to create a quickstart development environment, though note that it does not have a local stub of AWS Cognito User Pools.